a modern setting for this traditional mural theme. This contemporary sky mural in a modern interior was chosen by the client to act as a focal point and raise the perceived height of the ceiling. 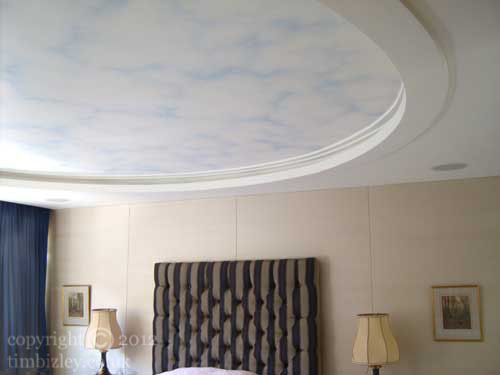 The sky mural was executed in acrylic and glazes directly on to the ceiling surface. The blue is a tint of the colour of the curtains and links also to the same color used as accent in other soft furnishings. This shows the potential to adapt a traditional theme for murals to the modern interior. Specialist decoration can enhance and individuate the modern interior, removing it from the drab and uniform by providing accent and focal point. Contemporary murals can enhance and fit with modern notions of design and can echo the figurative traditions of the past or indeed be completely abstract and decorative. Private client work London UK.